It's really fun entering challenges, some just for the fun of it, some have prizes. This stamp set was a prize, it's called Starburst Fairies from The Stamp Man. When I saw this sketch, I immediately thought of this Heidi Grace paper and this set of stamps. Wish you could see the little bits of sparkle I added with the Clear Star pen, hence the name Pixie Sparkle. Supplies: 5 1/2" square purple card blank, Papers: Stampin Up-Perfect Plum, Mellow Moss, Whisper White, heidi grace designs-Floral Row, Stamps: Starburst Fairies-The Stamp Man, Ink: Ranger Archival Ink-Jet Black, Distress Ink-broken china, dusty concord, spiced marmalade, Sakura Gelly Roll pen-Clear Star, Fiskars tearing ruler, Fiskars shape cutter template-Circles-1, silver cord, pop dots. Very pretty!! Glad you played along with us at JFF this week! Great use of color on your card! 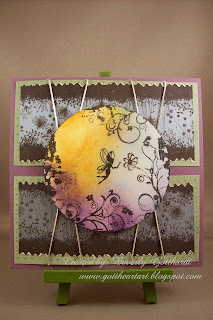 You nailed the Color Challenge for Just For Fun Stamps! Thanks for playing along with us! Love the fairy and thanks so much for telling us where things come from--I'm headed over now to see what goodies can be found! Oh my goodness, this is beautiful! Great take on the challenge and thanks so much for playing along with us at DDCC! Good luck! Such a pretty card. Love the colors and the great images. :o) Thanks for playing along with us at DDCC.